Looking for something to do in London with the kids for half term next week? I’ve rounded up 12 London museums offering family activities. Best of all they are completely FREE – costing nought for either admission or the events themselves! 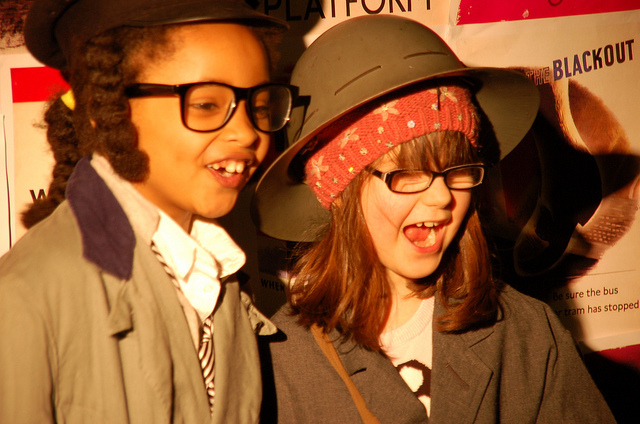 One from the archives – daughter and friend enjoy some museum dressing up! A costumed storyteller will be in the Museum telling some of the adventures of Toad, Badger, Ratty and Mole, the popular characters from ‘The Wind in the Willows’ whose creator, Kenneth Grahame, was Secretary of the Bank from 1898 to 1908. Meet some local minibeasts on Monday,try your hand at puppet making on Tuesday, dress up in period costumes on Wednesday and come mudlarking on the foreshore on Friday. Lots of ‘Ideal Homes’ themed craft activities throughout the week – make furniture sculptures, candle holders, plates and cup ornaments, bean bags, wall art, mini living rooms in a box, glorious garden cushions, a marvellous mirror, a designer lamp or a photo frame. There is story telling throughout the week for under 5s too. Ravenous Reptiles – fun hands-on specimen based activities. See my review of the Grant Museum here. From Monday to Wednesday you can create some beautiful paper flowers hidden inside a decorated cup, and watch the flower ‘grow’. On Thursday and Friday you can make nature nests, complete with mini-inhabitants. A Young Person’s Guide to the Hunterian – family friendly tours. Fun hands-on activities, getting up close with Kenwood’s collections and drawing inspiration from the Masters. There’s something for families every day, kicking off with the weekend Family Festival: The City we Live in. This is followed by musical and story sessions for toddlers, art workshops inspired by London’s stained glass and parks, mapping London landmarks, exploring the stories behind London’s street names and drama workshops. Art drop-ins include create your own city scenes, help add to their giant map project and transform maps into works of art. There’s also a workshop to create a beautiful art piece inspired by the words of different cultures and an ‘Explore the City’ themed toddler session. More information on their half term activities is promised soon. Happy Birthday Queen Victoria! Expect bunting, slices of Victoria sponge cake and lots of fun family activities – make you very own, very regal crown, create a silhouette of the Queen’s regal face and send a birthday card to Queen Vic! A Victorious Victorians themed week! Activities include a Victorian Children’s Trail, dressing up, an Investigation Station, making a simple cup-and-ball toy to take home and storytelling with The Selfish Giant by Oscar Wilde. British Sign Language interpretation is available for the 11.15 and 12.00 storytelling shows on Friday 30 May. Don’t forget the nationals! The British Museum, National Gallery, National Portrait Gallery, Natural History Museum, National Maritime Museum, Science Museum, TATE, V&A Museum and The Wallace Collection will all be open, FREE and have plenty to keep the whole family entertained. Wishing you all a very happy half term, whatever you get up to! Too. Much. Choice! Oh dear. But a great list. Thanks! I know, makes me wish half-term was much longer! Shall I just list 5 next time, or simply revel in the fact that London museums have so much going on? We have such fabulous free museums. I also recommend the Discovery for All session at the Horniman Museum. A brilliant drop-in session in the Hands-on Base.